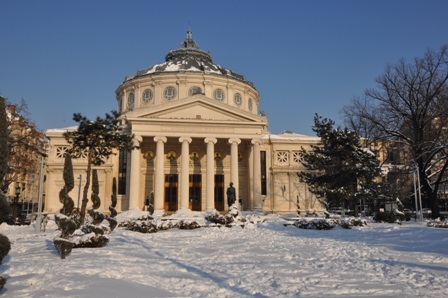 To answer to why we chose Bucharest in January you have to know a little bit about our collections and travel interests. The first thing to know is that the more countries the better. 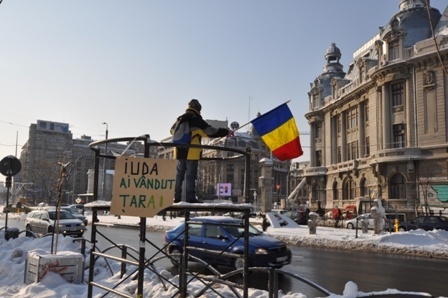 We have never been to Romania and we had heard good things about Bucharest in general. The people were very friendly and the city was well laid out with nice, interesting architecture. 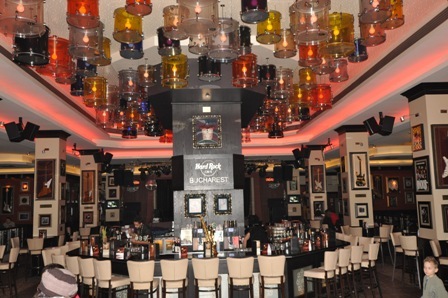 The second thing is that Bucharest has one of the few Hard Rock Cafes in eastern Europe. Over the years we've collected a lot of pins and teddy bears from Hard Rock Cafes all over the world. But why January? 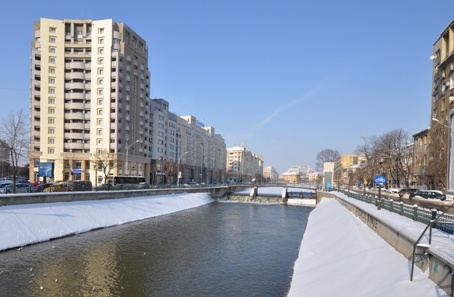 Surely Bucharest is nicer in the spring or fall. For sure, but I also collect passport stamps, and Romania was to implement the Schengen regulations a couple months later. Why does this matter? Well, since we now live in Germany this means we'd miss our opportunity to get a passport stamp, and I didn't anticipate making the trip from the US when we lived there. 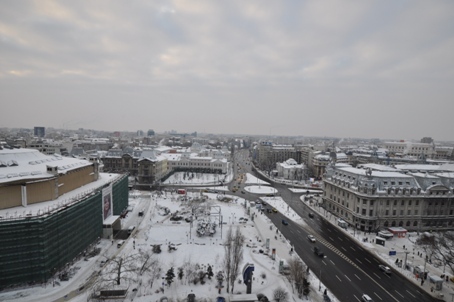 So we went to Bucharest in January 2012. 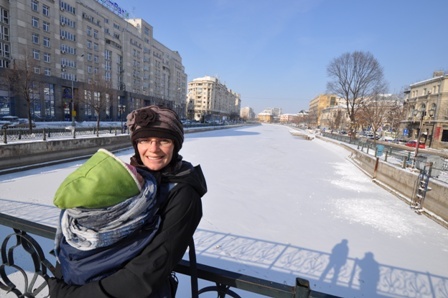 It was Greta's 14th country visited in 7 months of life. As you'll see from the pictures it had snowed the day before and was extremely cold. So not ideal conditions for a visit, but we enjoyed our time walking around and seeing a few sites. 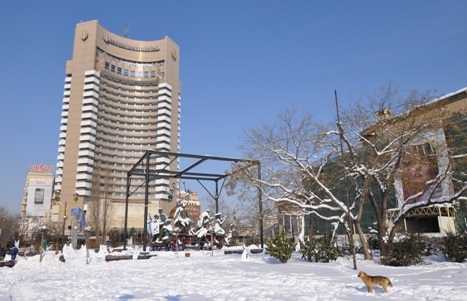 The Intercontinental Hotel was a great location and very cheap in January. For full resolution photos from the trip to Bucharest click here. As I mentioned we stayed in the Hotel Intercontinental in University Square (Piaţa Universităţii). The staff was very friendly and the location was great. Everything you see below was within walking distance except the Hard Rock, which was an $8 cab ride away. The right hand photo shows the view of the entire square from our hotel balcony. 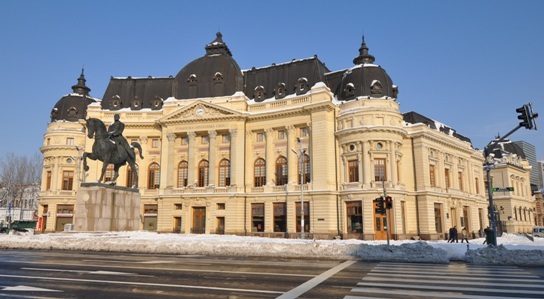 Next to the hotel is the National Theater, which was under renovation and covered up. You can see it to the right of the left photo in green. 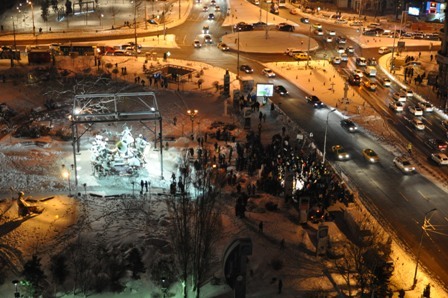 The square is pretty famous and centrally located, and as such, is used by many demonstrations and celebrations. 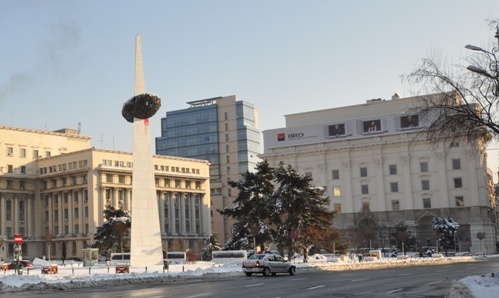 The square hosted the last demonstration before Communist Leader Nicolae Ceaușescu was brought down. During the weekend of our visit there was a modest demonstration from folks opposing a change in the health care law. And here are a couple photos of the aforementioned protesters. 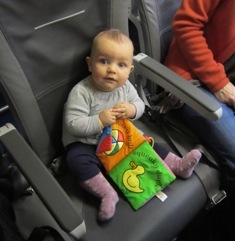 Fortunately, we were high enough in the hotel that the noise from the chanting didn't disturb us or Greta. 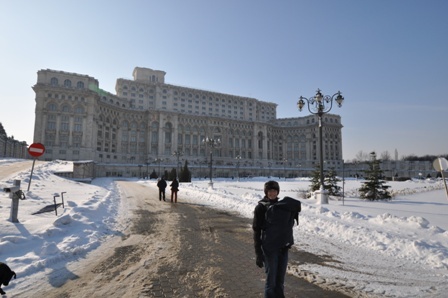 About 2km from our hotel was our first stop the Palace of Parliament. 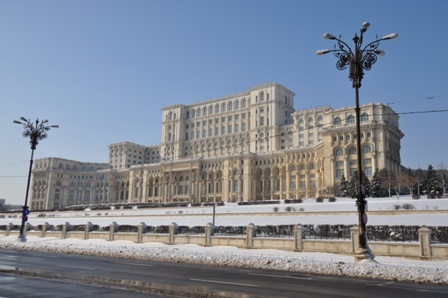 Locals call it the People's House (Casa Poporului) and the builder, Nicolae Ceaușescu, called it the House of the Republic (Casa Republicii). You can click on the link to see the details, but essentially the building is one of the largest in the world. 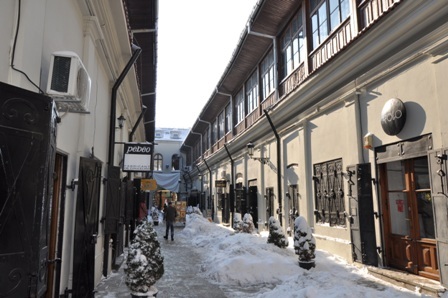 Our plan was to make the long, cold walk to the palace, take the tour to warm up, and then walk around the older Lipscani section of town. Unfortunately, our plan was foiled on a couple levels. The next available tour was 50 minutes after our arrival and you needed your passports in order to buy a ticket. Just hanging out with Greta for that time, plus a guided tour that we couldn't cut short if Greta got fussy was not a great idea. And since we didn't bring our passports the point was moot anyway. So we braved the cold weather and walked back. If I didn't mention it before... it was a cold day. The second plan of our morning stroll was foiled in Lipscani. We were going to grab lunch at a cafe and warm up. However, even though the area boasts tons of restaurants and clubs, none appeared to be open before noon on a Saturday. Therefore, we just ended up back at the hotel for lunch. However, on the way we did stop at a few things to take some photos. 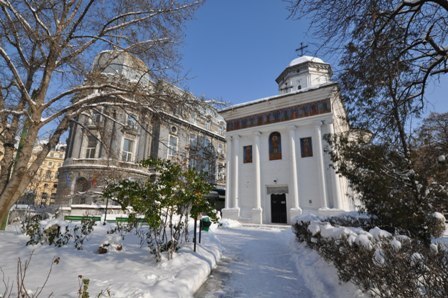 In the left photo is the Biserica Curtea Veche, which is one of the oldest churches in the city. 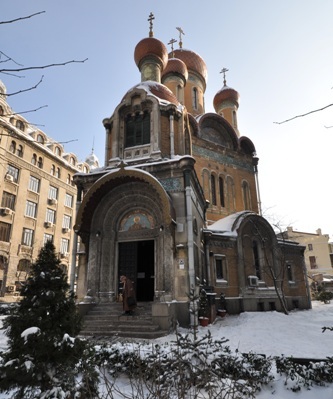 In the right photo is the Greek Orthodox Church of Saint Dumitru. 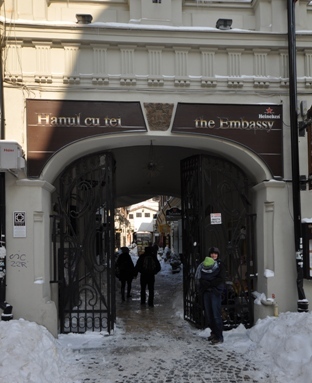 A neat place was the Hanul cu Tei, which is a historical trading street built in 1833, but today houses a number of nice artist shops. Make sure you have a map and keep an eye out. The entrance is very non-descript and easy to miss. 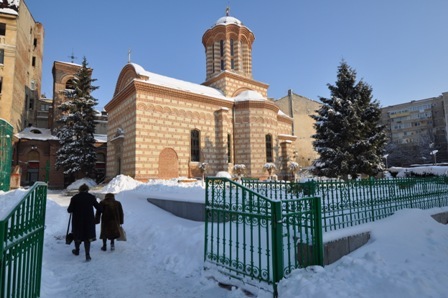 Our last stop in the historic Lipscani district was the St. Nicholas Russian Church. The church appeared to have been recently refurbished and was a gem. 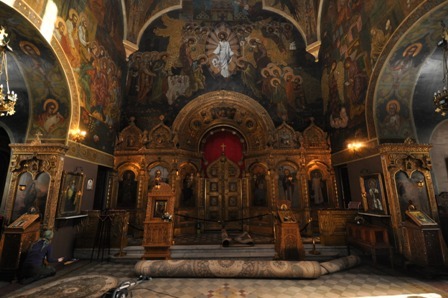 Check out the Lipscani subfolder of high resolution photos for more images of this wonderful church. 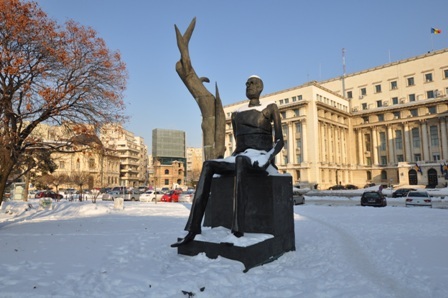 The park itself contained a number of sculptures and other monument and many were covered in the snow. Around the Revolution Square are some cool buildings. In the left photo is the Architectural Union Building where the new structure was built within the shell of the older building. 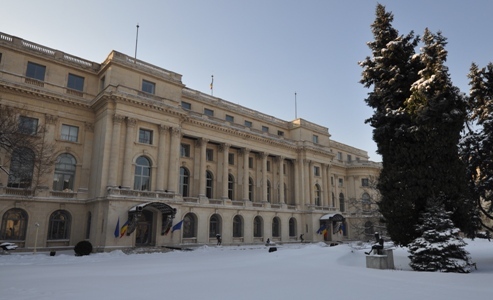 In the right photo is the Library of the University of Bucharest with the Statue of King Carol I in front. 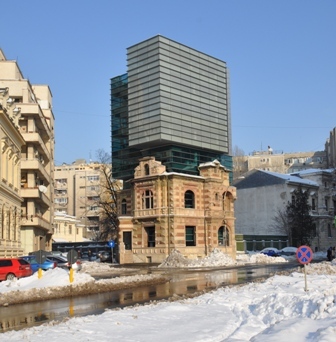 Across the street from the University of Bucharest Library is the National Museum of Art. 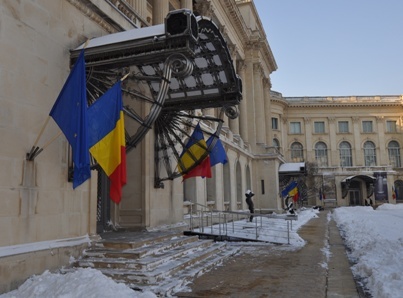 I'm sure Romanian art is spectacular, but we did not go in. However, I did really like the stainless steel awnings over each door. 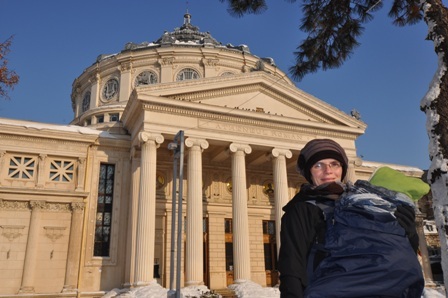 As we exited the square toward the Metro we stopped by the Romanian Athenaeum (Ateneul Român), which as you can see is a very pretty concert hall. 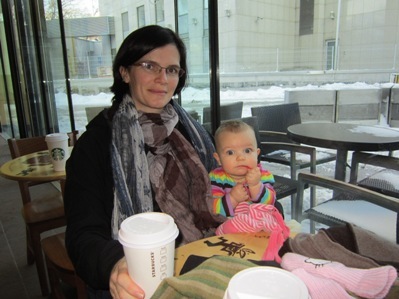 We figured out the Metro and hit one of the many Starbucks in town. We grabbed a couple hot chocolates to warm up and expand Erynn's mug collection. For dinner we hit the Hard Rock and Greta joined us with her applesauce. 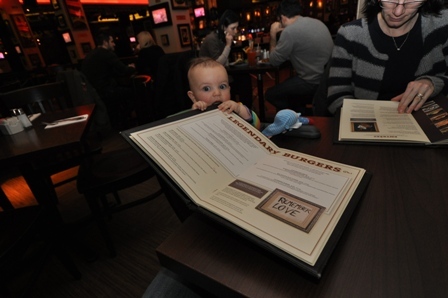 But not before having a go at eating the menu first. The next morning we relaxed in the hotel before hitting the airport. A great little weekend city break!